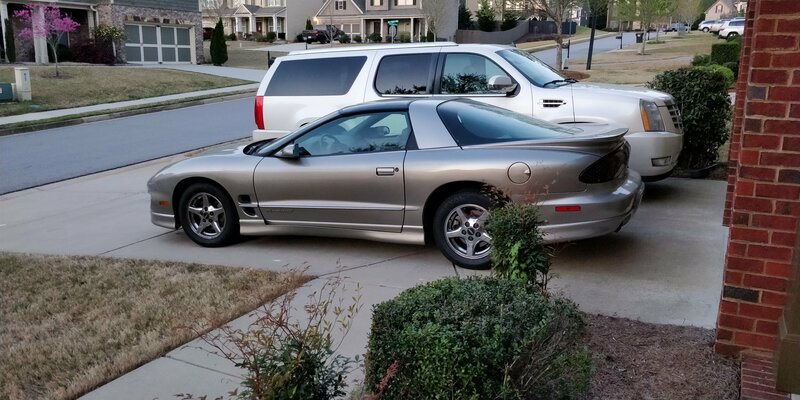 I'm sure no one remembers, but I sold my Firebird like five years ago, and I just bought her back over the weekend. 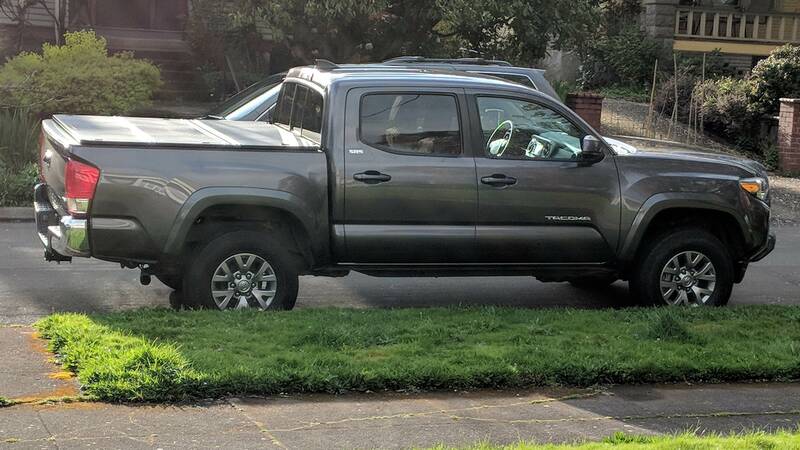 My 2017 Tacoma got rear ended a few weeks ago. Yay! Total bill to the other person's insurance was around $3500. Mostly just wrecked the bumper assembly. Not too bad for my first "wreck" ever. Insurance stuff went fine, and I got it into the shop the dealer refers to very quickly. I saw the car incoming after I had stopped at a stoplight so I let off the break to go for the gas which might have eased the impact a tad. I bumped forward a bit. Other person's 91 Corolla was totalled. The radiator was smashed nearly vertical. We were both just fine, thankfully, and were able to get the vehicles into the closest parking lot quickly... the parking lot of an auto body shop. I've had so many people hit me in this damn new car! This is the third instance! The other two were while it was parked with no notes. Blargh! I plan on keeping this vehicle till it dies, so I guess this is some character development. Probably should give it a name at this point. I changed the oil in my car today by myself. Took me all afternoon. Highlights include dropping a wrench in the used motor oil and having to fish it out, and dropping the old oil filter into the used motor oil and it splashing everywhere. Cleaning motor oil off a garage floor is not fun. Also I found a new Car Problem to add to my list. There's a red light on the dashboard that says BRAKE. Now I'm assuming it's just the light to let you know the parking brake is on. The light's always on though. I reached under the dashboard and jiggled wires near the parking brake and the light went out for a few minutes but it's on again. Eh I'm probably just not going to worry about it. I don't know if Top Gear America is still a thing, but I'm watching the UK Top Gear (which is still, strangely, hosted by Matt LeBlanc). They got rid of Evans, now it's LeBlanc with Chris Harris & Rory Reid. They're a lot more comfortable with themselves and the banter flows smoother, without the stiffness that plagued the reboot first season. I also watch Grand Tour. I'll be moving back to the USA after about for years overseas. My car has been in storage at a storage service that has kept it clean, run the engine twice monthly, and moved the car monthly to ensure that the tires have no flat spots. The tires are the standard run-flats that come with the MINI Cooper S.
I'm planning a cross-country drive to get my car from Virginia to California. My questions are these: should I consider changing the tires; is there any reason to be concerned about the integrity of the rubber; and if a tire change is advisable, is there an issue that would prevent me from putting non-run-flat tires? Would the latter replacement screw with the car's pressure sensors? I'd get somebody to help me check them out. Not sure if you were wiggling something that might have just cut power to the light, or if it might be some part of the circuit that is being tested. You might want to check to make sure you've got enough brake fluid, too. Congrats on changing the oil. It gets easier. Probably a sub 30 minute job once you have practice. Maybe even 10 minutes. If your tires are 10 years old, then I'd replace them. Less than that, I wouldn't bother. You can put non-run-flat on a Mini. We did that on my wife's Mini. Reduced road noise significantly. I think 10 years is the max. If they are more than 5 years old, definitely get an inspection before your long trip. You can put non-run flats no problem, you just might want to consider getting a mini spare, or have some type of roadside assistance if you get a flat. Do not use the spray cans like fix-a-flat as those can mess up the sensors. Did you already check into having the car shipped instead? It might not be that much more expensive than the drive. Red brake light could mean couple things, your parking brake is on, low brake fluid, or a malfunction in the electrics for the braking system. Anybody ever bought from Carvana? As fun as my wife's Mini was (at least until it really started to show wear and tear) I would never want to take a cross-country trip in it especially on the run-flats, unless I planned to get new fillings when I arrived. I looked into it recently but the bad reviews scared me off. While I understand that Yelpers et al will generally complain loudly and frequently about even minor issues, what concerns me about Carvana is that people seem to report the same types of logistical and informational issues that people reported years ago. Personally I had a rather positive experience buying used through Carmax. While there is potentially a charge for a transfer depending on distance, they are nominal unless you're going coast to coast or something, and there's no commitment whatsoever at that point. They were also very straightforward in terms of pricing, warranties, and registration etc. Reddit seems to have generally favorable Carvana reviews. Looking at a 2016 car with 11K miles. Newer and more money than I was shopping, but the math lines up to be a good deal if you calculate a year 's depreciation and the much lower mileage vs the year older 2015 I'm comparing to. Not to mention the extra warranty. Thanks for the input guys. As far as I can tell the brake system doesn't have any sensors or electrical bits. I replaced the brake fluid last year when I worked on the rear brakes. Although I thought the front discs were okay, I'm out driving it today and there's some slight wobbling when I brake, I'm wondering if the discs are warped or something. Still, the car stops reliably, and that's the most important part. Most cars now days have atleast a low brake fluid level sensor (usually in the bottom of the master cylinder), and if you have abs, it will have 3 or 4 wheel speed sensors, on top of a module to control everything. Also the brake lamp switch is also integrated into the abs/braking system, if you said you wiggled some wires under the dash, I would check the brake switch, should be located at the top of a brake pedal, or the parking brake switch which should be a small switch with one or two wires located on the parking brake assembly. Today I replaced the long overdue window motor/regulator on my 2003 350Z. This is the second time the passenger side needed to be done. I'd ordered the part from ebay for $30, which is a whole lot cheaper than what a dealer charges ($400). Take the door apart, replace the motor, start putting it back together to the point where I can test it, only to realize that the thing still isn't working properly. It goes down slightly when you open the door like it's supposed to, but it won't work with either the driver or passenger switch. After pulling out the multimeter and checking over half the car, I finally realize that somewhere along the way, I bumped the window lock out switch on the driver side. The old motor was bad, and at a minimum needed to be reset so that the safety stop would quit engaging, and the slight drop with door opening hadn't worked in over a year with the old motor. It wasn't that I did a job that didn't need to be done. I just wasted 2-3 hours going back and forth to the car trying to figure out what the heck was still wrong after I replaced the motor. Stuff like that makes you feel dumb, though. Anybody got a handy way to remove a tiny all glass broken bulb? Pull and pray to god it dont break in your fingers. Edit: if your talking those tiny peanut sized bulbs, you can sometimes get a pick between plastic and the bulb, or break the glass intesionally and grab the middle with small needle nose pliers. Potato may work on a twist bulb, but this is one you pull straight out. The bulb has shattered and I ripped the exposed wires out when pulling on them. At this point there is just shattered glass stuck in the very bottom. I think I'm going to have to get a whole new socket. If it is a push in, can you not get it by prying out the stuck part with a small, flat head screwdriver? Be careful not to have power on and short anything out. I tried just stabbing a flat head down in there to pulverize the bulb until it was tiny pieces and hopefully it would all fall out, but there is still enough stuck that the new bulb can't go in. thats what I usually use in the case such as yours. Good call. Everybody needs those. Even if you don't know it yet. And you need a magnet on one of those telescoping antennae things. Not for this, but you'll need it when you drop bolt down a blind whole somewhere, sometime. Now just to get the car home.